Archaeologists sometimes find unusual sites along the highway right-of-way. An example is the Sitio Creston site, located on a hill near Las Vegas. Twelve circular stone enclosures, built of two to four courses of dry laid rock, were found along with pottery and stone tools. Few dwellings of this type have been studied in New Mexico and little is known of the people who built them. Dating between AD 560 and 1030, the site yielded ceramics similar to a type produced by people living in the Taos Valley during the twelfth century. Bison were among the most important game animals to prehistoric people living on the plains of New Mexico. Due to their size, bison were usually processed for food, robes, and tools near where they were killed. Few "kill" sites have been preserved. Luckily, highway archaeologists working at the Townsend Site in Chaves County found evidence of reoccurring hunts where small herds of bison were surrounded or ambushed at the wash, butchered, and processed. Radiocarbon dates and distinctive dart and arrow points dated these hunts to between 490 and 250 BC and between AD 1200 and 1400. Analysis of the skeletal remains, including a newborn calf, provided clues to the animals' health, the environment of the region, and what strategies the hunters' employed. For example, at the Townsend site, the season of the hunt can be determined because bison calves are born from late March to early April on the Southern Plains. The presence of full-term, neonatal calf remains suggests a springtime kill. Crew member excavating one of the stone-ring enclosures at Sitio Creston. 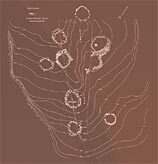 Map of Sitio Creston showing the individual stone-ring enclosures and their distribution across the ridge top. Topographic lines give an idea of the height and steep-sides of this ridge.